Many board games have a shelf life of three years, but Mike McManaway's invention has lasted 20 years and spread to 30 countries. 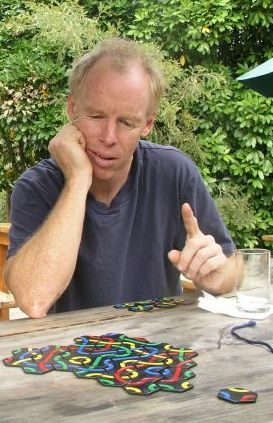 Tantrix has sold 2 million copies worldwide and allows McManaway, 47, to spend much of his time feeding his climbing addiction in New Zealand, and France where he spends half the year. The Mapua man created the family strategy game on March 20, 1988 while sitting in a tent with a broken collarbone during a failed climbing mission in South America. He was already addicted to backgammon and two years earlier had achieved the title of New Zealand champion. Tantrix was originally called the Mind Game, and McManaway painted the first 100,000 plastic tiles at his home in Heathcote, Christchurch. "It was not a company in the beginning, it was my hobby." He has made a full-time living out of Tantrix since since 1994, when it secured its first big contract, which was with Air France. It purchased the game to give to children on its flights. McManaway also owned a chain of four games shops, called Mind Games, which was where he first sold Tantrix. The shops are no longer around because a year after he sold the chain it went bankrupt. The game has evolved since 1988 with a number of different versions, including Tantrix Match released less two years ago. It combines the logic of the popular Sudoku puzzles and the geometry of Tantrix. Tantrix is a family game and a strategy game, which also requires some luck to win. That was the key to its success, McManaway said. "Luck is where the addiction comes in. An eight-year-old could do rather well. "She will usually lose to you, but she can win and that's what keeps her interested." McManaway said there were people whose only goal in life was to become better at Tantrix. It was played on the internet and more than 2500 people played in Tantrix tournaments all over the world. Last year 172 competitors took part in the 10th World Tantrix Championship, which McManaway won for the first time. He practised three hours every day for five months to win the championship. There have even been Tantrix marriages as people who met each other playing the game have married. It has also won a swag of awards all over the world, including toy of the year in Hungary in 2003, and puzzle of the year in Australia in 2000. "There are a lot more things you can do with life, yet Tantrix is still hanging in there." McManaway has appointed a team of more than 20 agents who have the life-long right to sell the game in their specific countries. He gets a royalty from every game sold. New Zealand sales have plateaued, but he was concentrating on expanding into other countries. The German market, which was bigger than the US, was gaining momentum, three years after Tantrix was first sold there. McManaway also wanted to enter Russia and China, but was concerned about losing control of the intellectual property and would need to find the right agents first.